Nicosia (Lefkosia) is the capital city of Cyprus, and some would say it’s very heart and soul. 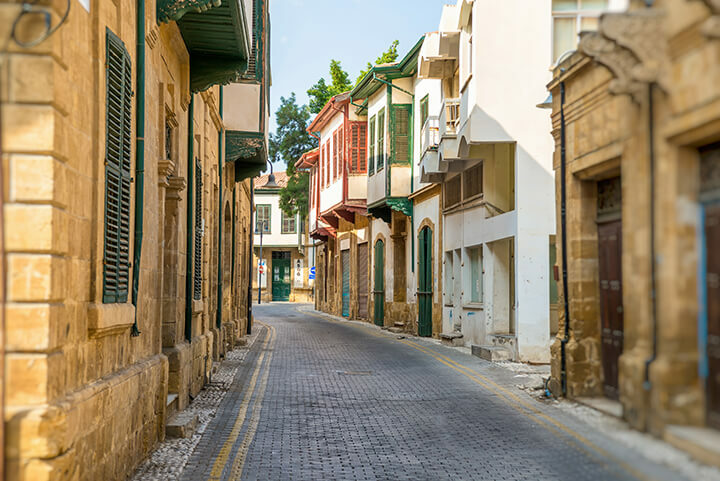 If you have limited time to see Cyprus, then Nicosia should be at the top of your list. The old city, steeped in historical and archeological sites, is surrounded entirely by a circular wall built by the Venetians between 1567 and 1570, the periphery of which is about 3 miles. The wall has three gates (Paphos Gate, Famagusta Gate and Kyrenia Gate (in the Turkish occupied area), as well as eleven heart-shaped symmetric bastions. The Famagusta Gate with its two halls and passageway has become Nicosia’s Cultural Center and well worth visiting. The Paphos Gate is a controlled entrance point to the buffer zone, manned by the United Nations. Located on the grounds of the Ledra Palace (buffer zone), this is a new center, open on 9th December 2009, which is supported by United Nations Development Programme – Action for Cooperation and Trust (UNDP – ACT). The center will be equipped with training materials, audiovisual equipment, and resources about communications and media. The CCMC hopes to increase the ability of civil society organizations to speak for themselves, to enhance their public communications and encourage dialogue about reconciliation. The Center is on Athalassa Avenue, where you can watch traditional art skills and handicraft being made, as well as purchase Cypriot products. Located on Apostolou Varnava Street, which was the Old Electricity Generating Plant, and is now a center for contemporary art. The museum is on Hyppocratous Street in Laiki Yitonia, next to Eleftheria Square, which houses exhibits dating from before 2000 BC up to the present day. Found on the aptly named Museum Street and said to be the richest and best archaeological museum in Cyprus. It features treasures of art from the Neolithic Period (5800 BC) to the early Byzantine Period (330-1192AD), including Cypriot pottery, terracotta, clay and stone sculptures, bronze and jewelry. This museum is housed within The Archbichopric (The Archbishop’s palace), and displays the most extensive collection of Cyprus icons, with 220 pieces that cover the periods from the 5th to the 19th century. Located on Praxippou Street, Laiki Yitonia, where traditional jewelry from the end of the 19th century is on display. The Postal Museum is on Agiou Savva street, where you will find a stamp collection that is internationally acknowledged for having some of the best and most significant stamps in the world, as well as a rare collection of pre-war designed post boxes, an automatic stamping machine, pre-war scales, and medals. On the on the ground floor of the Bank of Cyprus Headquarters, where you will find a beautiful display of chronologically arranged coins from the 6th century B.C. to the present day. Housed on the 11th floor of the Shakolas building on Ledra Street, where you can take in 360-degree panoramic views of the whole of Nicosia town. Of course, no visit to Nicosia would be complete without a shopping trip, and there is plenty on offer both in the Old City, as well as the new town along Arch Makarios Avenue. The places listed above are just a very few of the many exciting things to see in Nicosia. Stop off at a Cyprus Tourist Information Center for much more information. Get your free CTO map of Nicosia.